The Class of 2018 walks up Richland Avenue during the annual walk through the Alumni Gateway. Photo by Hayley Harding. 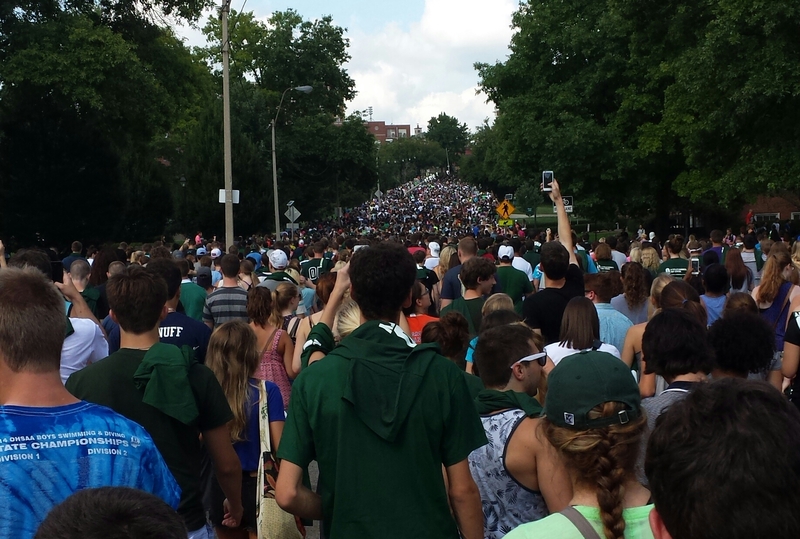 Ohio University’s 2014-2015 freshman class has shattered many previous university-wide enrollment records. According to information given at the Ohio University Board of Trustees’ Aug. 28 meeting, the freshman class, which consists of 4,400 students, increased 3.5% from the 2013-2014 school year. The freshmen are not the only people affected by the overcrowding. The unanticipated increase in OU’s population has caused some frustration for many returning Bobcats. Sophomore political science major Meghan Dickerson is one of the students upset by the increasing student population. “I think it’s great that the freshman class is so big, but once they met their quota, I feel like they should have stopped admitting people,” Dickerson said. In order to accommodate the large influx of students, many rooms used as doubles in the past have been converted to triples. Jacob Lowell, a freshman studying journalism, is in one of those new triples in James Hall. For the first time in several years, some resident assistants even have roommates. It is also much harder to get a room change this year than it has been in previous years. For that reason, many RAs and other residential staff are working to make sure people attempt to mediate problems with roommates instead of just requesting room changes. Residential staffs are facilitating roommate agreements, where everyone living in a shared space comes together to agree on topics such as when lights should be out or what to do when guests are over. Students are also reminded that there is always a good chance that any problems with living situations will simply move with them into their next space, so working out any issues that arise is recommended. Some people were initially unhappy about the surplus of students on campus but see it as less of a problem as the year progresses. Sophomore Jordan Stickle, an integrated media major, expressed mixed feelings about the situation. “The first week, when none of the freshmen knew what was going on, the lines at the dining hall were ridiculous, but it’s gotten better,” Stickle said. Students also recognize that the extra people affect their lives in more positive ways. While the confusion of the first week was intense, in the long run, there might be great benefits from getting to know extra people. “Having extra roommates also makes it easier to make friends and network. You have an extra person to make friends through and talk to,” Lowell said. Freshmen are eager to join clubs and organizations on campus, which means that many student groups also have to address the issue. Several organizations across campus are finding ways to accommodate the influx of new members. “I work for Fridays Live and at our last meeting we had so many freshmen that we have to create new positions in order to work with everyone. From that angle, all the extra people is a pretty good thing,” Stickle said. Jacob Lowell thinks that the size of the Class of 2018 will ultimately have a good impact on the university and the individual student experience. “Seeing how both this year and last year have been the biggest freshman classes on record, I think the standards for admission will be a little higher next year,” Lowell said. The trend may continue in future school years as well. Through the “Strategic Enrollment Management Plan” (SEMP), all Ohio University campuses are working toward a goal to increase admissions until at least 2016. However, because of the huge number of students in the past several years, many people expect that next year’s freshman class, set to graduate in 2019, will be handled differently in order to avoid another housing problem. Only the future will tell if the increasingly large classes will be a benefit to Ohio University instead of an obstruction. Until then, students will have to take the appropriate steps to handle any complications that arise.